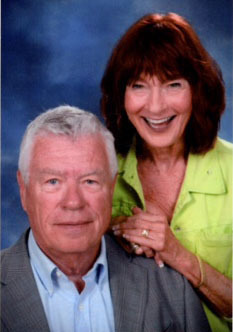 Lifelong Orange supporters John H. ’59 (ESF) and Janet K. (Smith) Dean ’61 (VPA), who met and later married on the Syracuse University campus, have established two new student scholarships: the Janet Kay Smith Feature Twirler Scholarship and the John Dean Endowed Lacrosse Scholarship Fund. The Deans have generously committed a $25,000 lead gift for the feature twirler scholarship and $50,000 to fully endow the lacrosse scholarship. 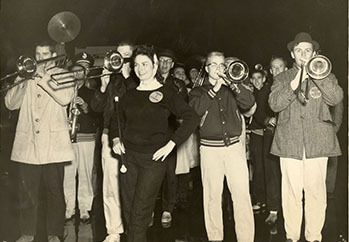 The Janet Kay Smith Feature Twirler Scholarship fund will endow the position in Syracuse University’s “Pride of the Orange” Marching Band (SUMB) known as the “Orange Girl.” The band has featured an Orange Girl since the early 1900s; from 1959-61, when the SUMB was called “100 Men and a Girl,” the position was held by Janet K. Smith, a music major in what is now the College of Visual and Performing Arts (VPA). Through the band she met John Dean, a paper science engineering major at the State University College of Forestry (now SUNY ESF). To fully endow the Janet Kay Smith Feature Twirler Scholarship, a minimum of $50,000 must be reached. With additional fundraising, the endowed scholarship will last in perpetuity with only the payout from the fund spent each year. For more information on how to support the scholarship, visit the University’s secure, online giving site or contact Jeffry Comanici, VPA assistant dean of advancement, at 315-443-9727 or jjcomani@syr.edu. The John Dean Endowed Lacrosse Scholarship Fund will support an undergraduate student on the Syracuse University men’s lacrosse team. The scholarship will allow the student to attend academic classes during the summer. Dean played lacrosse from 1956-59 and is a three-year letter winner. In 2009, he was named a LetterWinner of Distinction by Syracuse University’s Varsity Club. In addition to the marching band and lacrosse team, John Dean was a member of the Delta Tau Delta fraternity. Janet Dean was a member of the Hendricks Chapel Choir and Delta Delta Delta sorority. Today they reside in Columbia, Mo., where they are still involved in music, and John holds several advisory roles at the University of Missouri in Columbia.